Kimchi and cheese? Oh I'm so glad that I've discovered this very bold Asian fusion flavour. Well, all thanks to this brilliant idea by Tastemade at here. Their pork gyoza with four cheeses video has inspired me to cook these pan fried kimchi chicken gyoza with crispy Parmesan cheese base. Why chicken, not pork? Why Parmesan only, not four cheeses? Chicken because I prefer to cook my gyoza with healthier lean chicken mince. And I know that the addition of kimchi will help to make lean chicken filling moist and tasty enough for our liking. However, it is 100% ok to replace chicken with pork. Parmesan only because we all know baked or pan-fried Parmesan become like crispy waffles easily. Whereas, the other softer cheeses such mozzarella, blue cheese or even cheddar or tasty cheese won't become as crispy as Parmesan when they fried or baked. Hence, if I want my gyoza cheesy base to extra extra extra crispy, I have to use Parmesan only! Without saying much, here's my video showing how I cooked these gyoza. Trust me... They are very very very delicious. 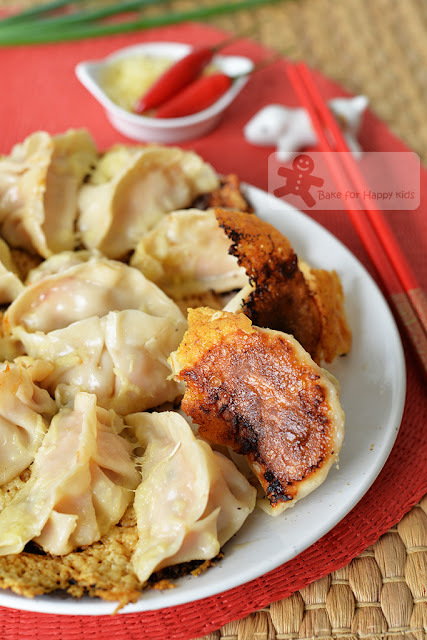 I've used the sweet and mild kind of kimchi to make these gyoza so that my chilli-hating son can enjoy these... and he love love love these dumplings! Plus, extra moist and tasty with the addition of kimchi!!! It is a BIG YUM for us!!! I have to say that your support is always my motivation!!! And it will be nice if you can LIKE, SHARE and FOLLOW me at either my Facebook at here or here or my Instagram @zoebakeforhappykids Thank you! Thank you!!! If you like your pan fried gyoza to be cooked with a non-cheesy skirt base, click HERE to see my other gyoza recipe and video. 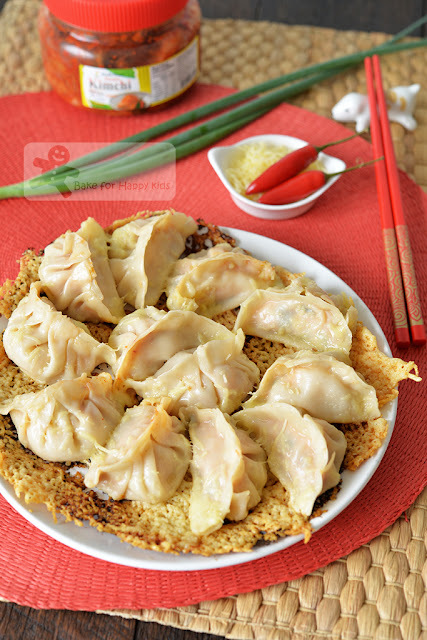 I grew up cooking and eating lots of Chinese dumplings for our Chinese New Year. According to my dad's Shangdong family tradition, the boat-shaped jiaozi and guotie / potstickers / gyoza symbolise yuan bao (silver and golden ingots). So, cooking and eating many of ingots-shaped dumplings will make us very very very prosperous year after year!!! Be happy and healthy. Eat lots of gyoza or potstickers and be prosperous!!! Now, here's my recipe to make these crispy kimchi cheesy gyoza / potstickers / guotie. 1/2 cup chopped kimchi, not blotted dry but at least well-drained with no excess liquid. * The kimchi will make this lean chicken or pork filling juicy and tender enough to enjoy but if you prefer your dumplings to be ultimately juicy, you should use chicken or pork mince with more fat. ** I used the ready made ones that can be bough from any Asian grocery shops. If you die die must make your own gyoza wrappers, please read my gyoza wrappers making tips at here. Combine kimchi, chicken or pork mince, spring onion and sesame oil in a large mixing bowl. Season with salt and pepper and mix until combined. Pour water from the center of the frying pan and let water spread out from the center. Cover the frying pan with a tight fitting lid and cook with low heat for about 10 mins or the gyoza filling is completely cooked. Remove lid and continue to cook until until the liquid has completely vaporised and bubbled off. 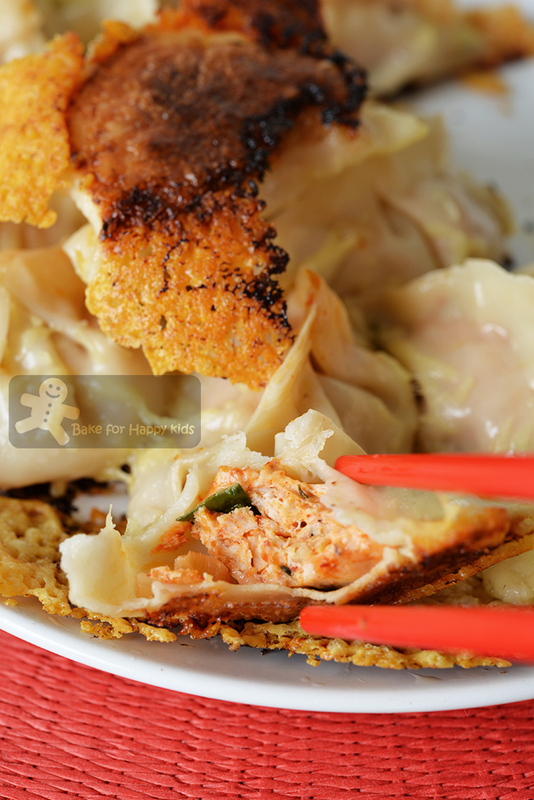 Sprinkle cheese at the spaces in between the gyoza and around them. Cook with low heat until the cheese is completely melted and the base is firm, golden brown and crispy. Serve with any of your favourite dipping sauces. We prefer not eat these gyoza with vinegar. Extra chili sauce is the best! Oooh yummm.... I once tried making gyoza but couldnt quite get that ccrispy bottom.